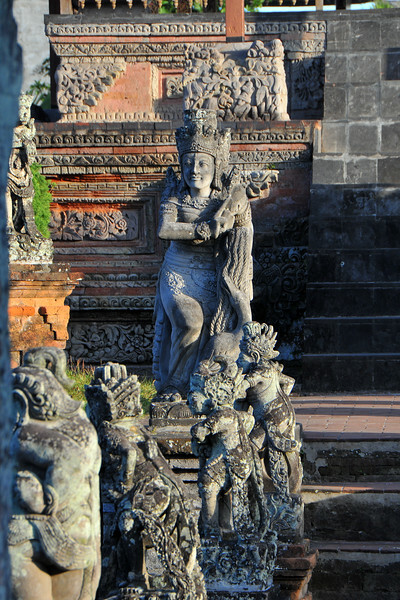 Balinese performing arts often portray stories from Hindu epics such as the Ramayana but with heavy Balinese influence. 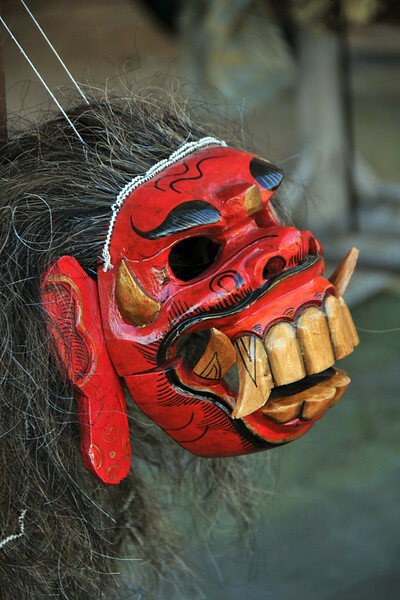 Famous Balinese dances include pendet, legong, baris, topeng, barong, gong keybar, and kecak (the monkey dance). 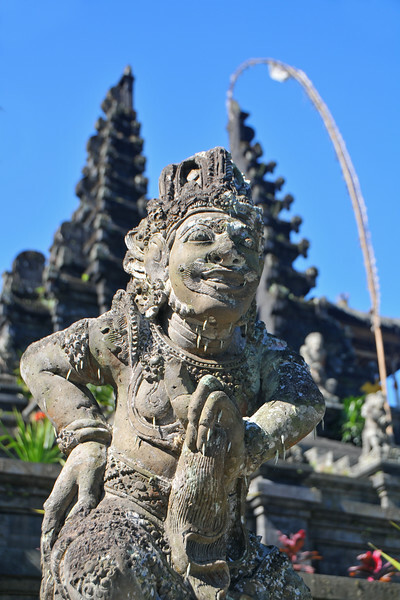 Bali boasts one of the most diverse and innovative performing arts cultures in the world, with paid performances at thousands of temple festivals, private ceremonies, or public shows. 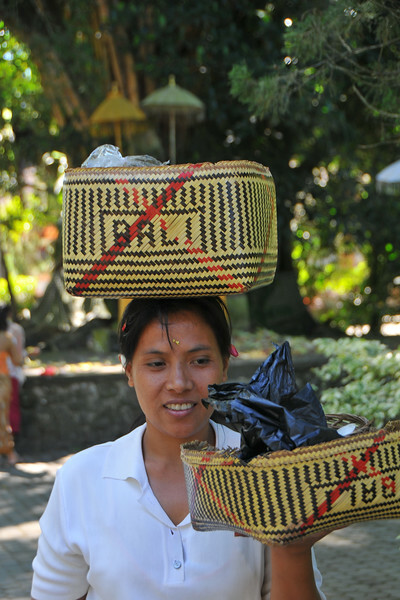 Bali has many different aspects. 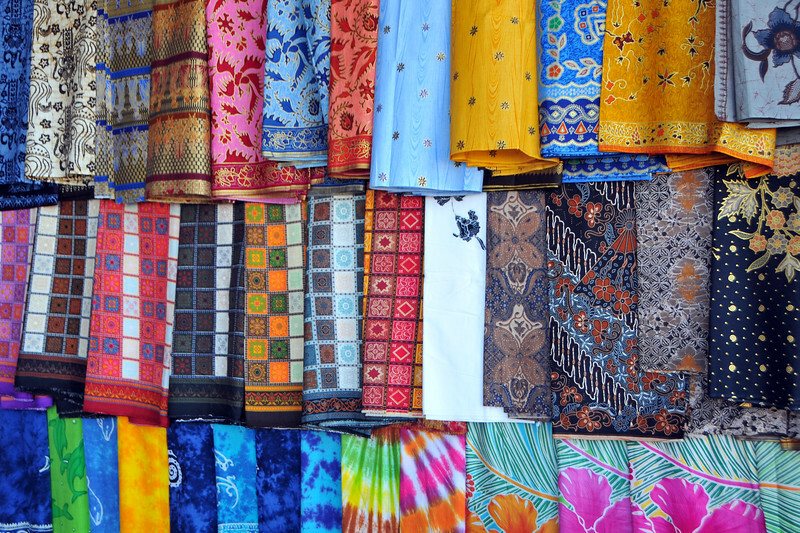 Ubud and the Central & North Bali has many art & traditional areas. Culture, tradition and slow paced. Sanur is towards the South-East and a beach location. A bit up market but not as much as Nusa Dua which is at the Southern part of Bali and has some of the most expensive beach resorts and hotels. South-west lies Kuta which is a popular beach location which also has a very active pub/night-life and draws a lot of crowd. 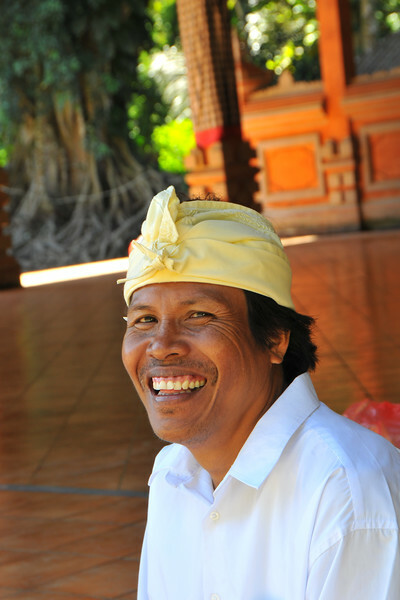 Depending on your taste, and where you visit you can experience Bali in a variety of ways. June, 2009. 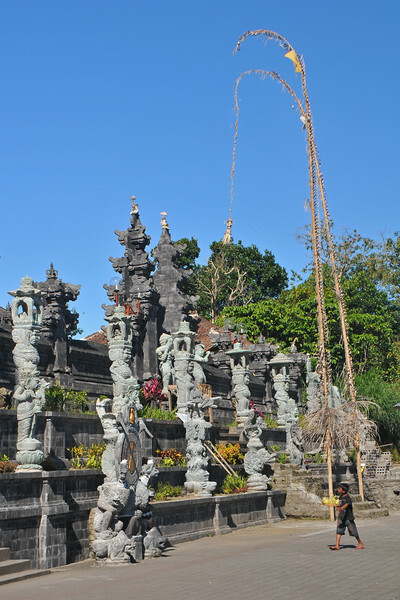 Goa Gajah, or Elephant Cave, is located on the island of Bali near Ubud and a short distance from Bedulu. Built in the 9th century, it served as a sanctuary. 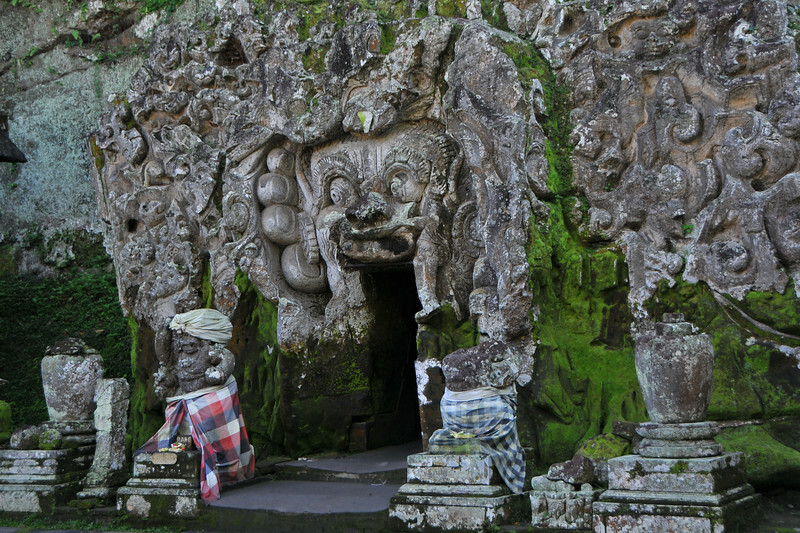 A carved entrance depicts entangling leaves, rocks, animals, ocean waves and demonic human shapes running from the gaping mouth which forms the entrance to the cave. The facade of the cave is a relief of various menacing creatures and demons carved right into the rock at the cave entrance. The primary figure was once thought to be an elephant, hence the nickname Elephant Cave. 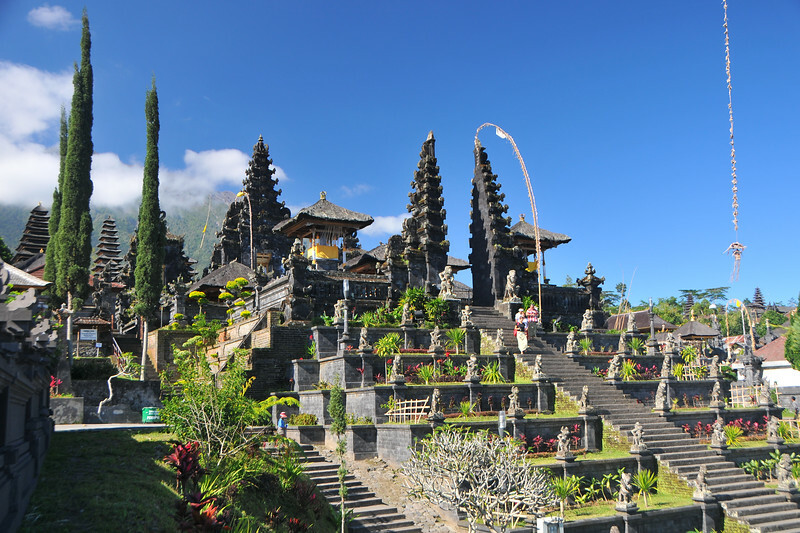 The site is mentioned in the Javanese poem Desawarnana written in 1365. Inside the cave one finds the Shiva lingum. 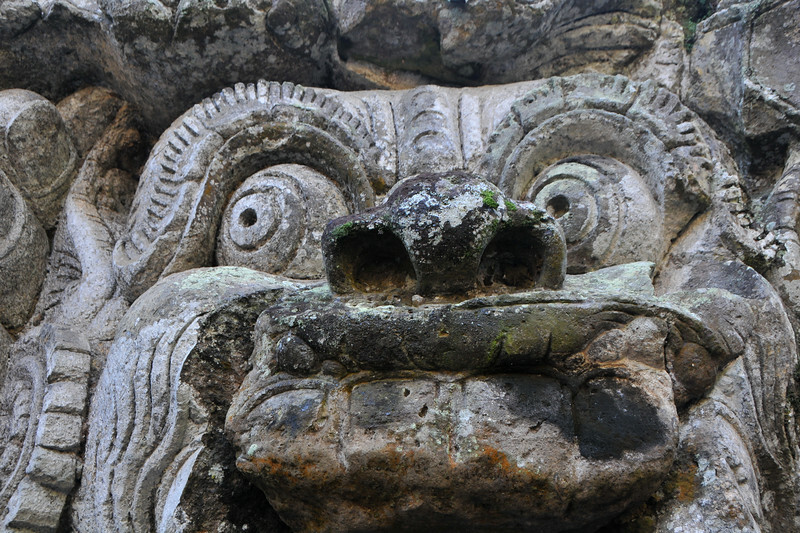 The monstrous Kala head that looms above the entrance seems to part the rock with her hands. Similarly decorated hermit cells are also found in Java. The large earrings indicate that the figure is that of a woman. The T-shaped interior of the rock-hewn cave contained niches which probably served as compartments for ascetics. 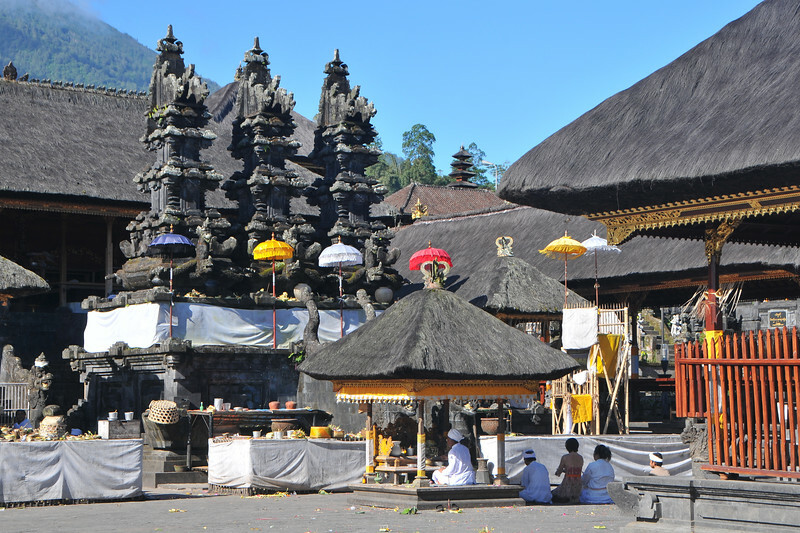 Goa Gajah is named after Sungai Petanu (Elephant River not an elephant as elephants are not found in Bali) and dates back to the 11th Century where it originally served as a dwelling for Hindu priests. 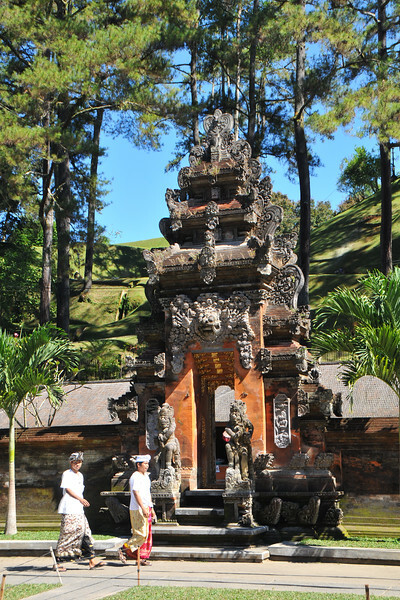 Outside the cave at the pavilion is a statue of Men Brayut, the Balinese woman who together with her husband Pan could not stop having kids. 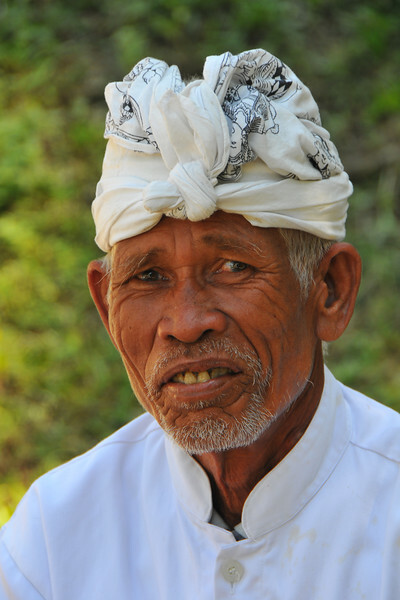 The legend of Men Brayut is also represented in local Buddhist writings, under the name of Hariti, indicating a possible Buddhist association with Goa Gajah as well as Hindu. Outside the cave, an extensive bathing place on the site was not excavated until the 1950s. These appear to have been built to ward off evil spirits. It is an UNESCO World Heritage site. 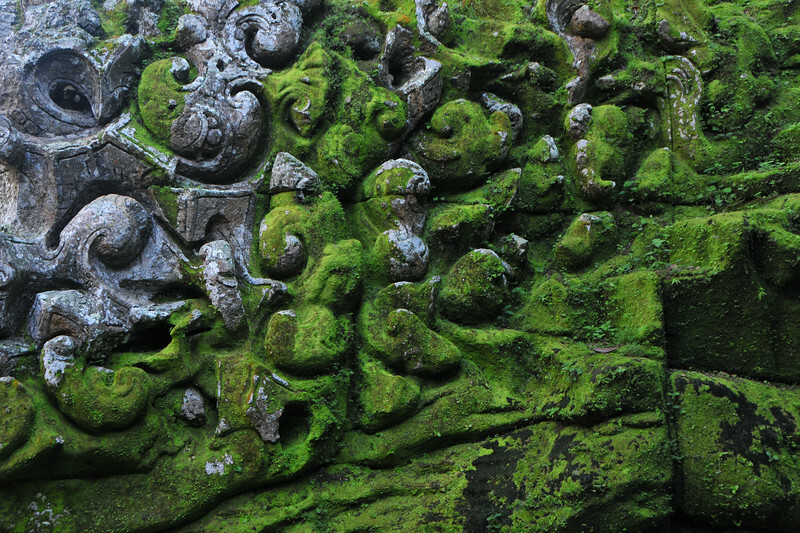 Close up of Goa Gajah. Elephant Cave, is located on the island of Bali near Ubud and a short distance from Bedulu. Built in the 9th century, it served as a sanctuary. A carved entrance depicts entangling leaves, rocks, animals, ocean waves and demonic human shapes running from the gaping mouth which forms the entrance to the cave. The facade of the cave is a relief of various menacing creatures and demons carved right into the rock at the cave entrance. The primary figure was once thought to be an elephant, hence the nickname Elephant Cave. 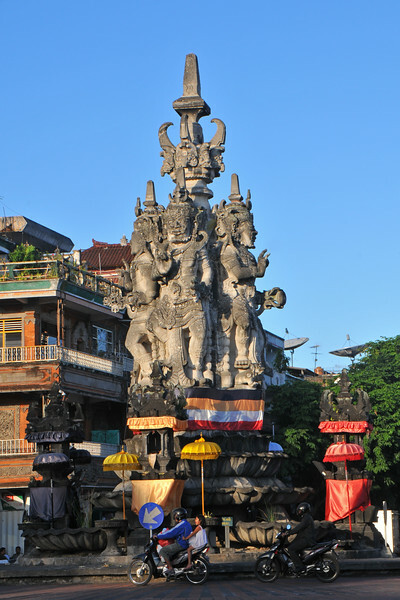 The site is mentioned in the Javanese poem Desawarnana written in 1365. Inside the cave one finds the Shiva lingum. 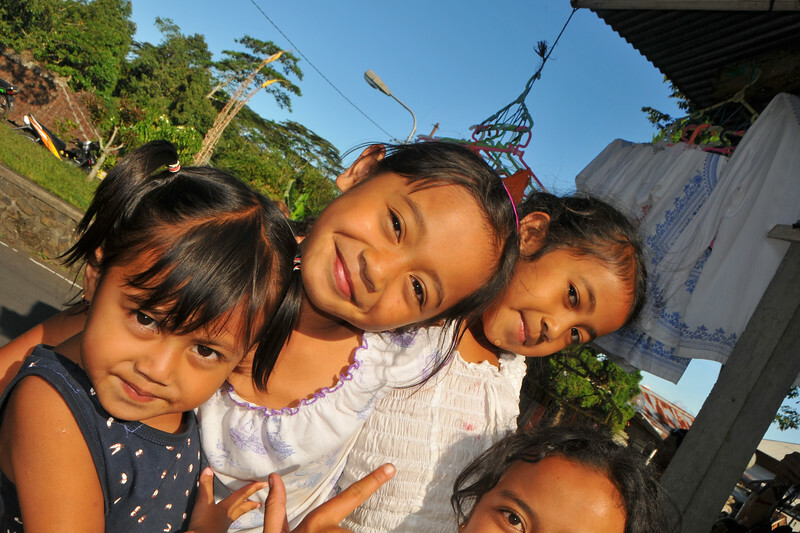 Local children at the The Ubud Monkey Forest which is a nature reserve and temple complex in Ubud, Bali. It houses over 200 Crab-eating Macaque (Macaca fascicularis) monkeys. There are four groups of monkeys each occupying different territories in the park. 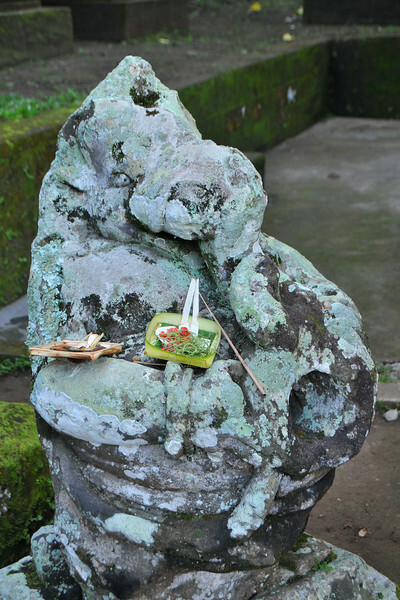 The Sacred Monkey Forest is a popular tourist attraction in Ubud. 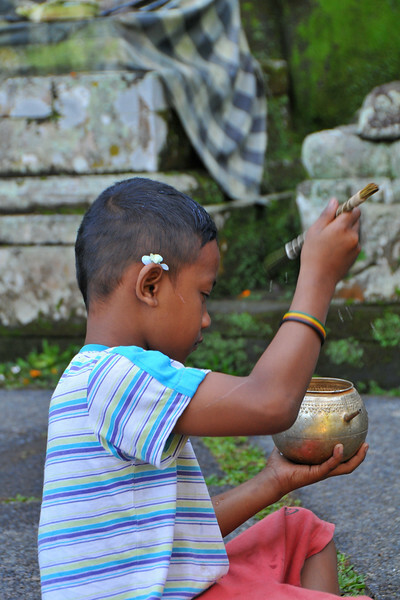 Children at Goa Gajah perform a Hindu ritual ceremony. This girl is praying and doing the hand gestures of prayers at Tirta Empul - The Holy Springs while taking a holy bath. Portrait of this young girl at the garden we went to for tea & coffee tasting. They also had a variety of herbs & spices. Kopi Luwak (pronounced [ˈkopi ˈluwaʔ]) or Civet coffee is coffee made from coffee berries which have been eaten by and passed through the digestive tract of the Asian Palm Civet (Paradoxurus hermaphroditus) and other related civet populations. What is amazing is that arguably, the most prized arabica coffee beans are not those growing on bushes but the ones found among the undergrowth, wedged in the excrement of wild palm civets. Its these beans that produce "kopi luwak", a chocolate flavored coffee that is one of the world’s most prized and expensive brews. Disgusting as it sounds, the civets eat the berries, but the beans inside pass through their system undigested. 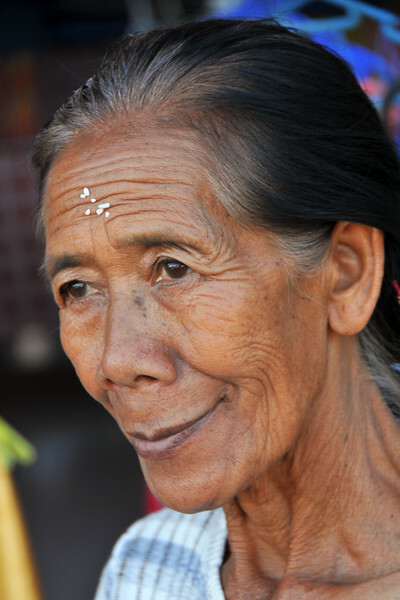 This process takes place on the islands of Sumatra, Java, Bali and Sulawesi in the Indonesian Archipelago, in the Philippines (where the product is called Motit Coffee in the Cordillera, or Kape Alamid in Tagalog areas) and in East Timor (locally called kafé-laku). Local lore in Vietnam has given the name "weasel coffee" to civet coffee, in what is considered the closest recognizable translation to English. Kopi Luwak is the most expensive coffee in the world, selling for between $100 and $600 USD per pound, and is sold mainly in Japan and the United States by weight, and served in coffeehouses in Southeast Asia by the cup. It is increasingly becoming available elsewhere, though supplies are limited; only 1,000 pounds (450 kg) at most make it into the world market each year. Mount Batur (Gunung Batur) is an active volcano located north west of Mount Agung, Bali, Indonesia. 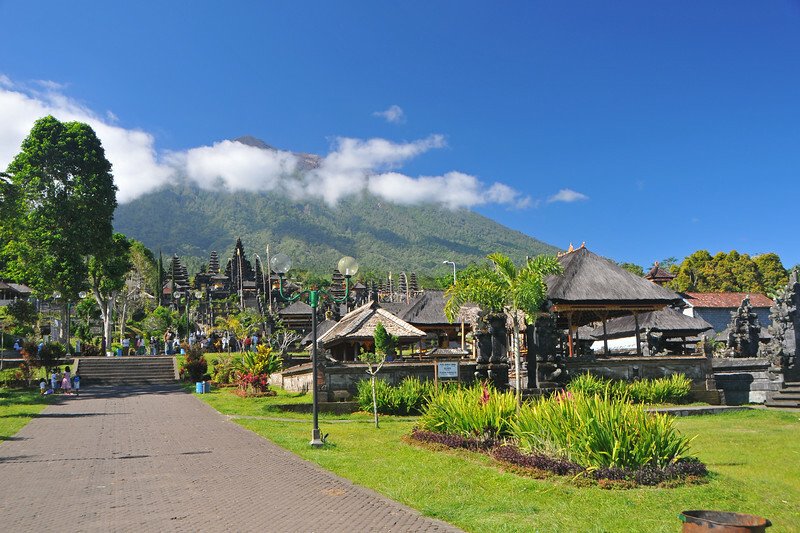 Mount Batur is a perfect volcanic experience which attracts thousands of tourists every year. 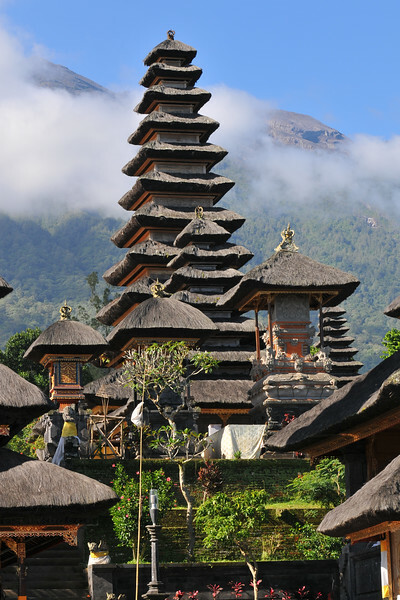 An hour's drive from Ubud, Mount Batur is considered sacred by the Balinese and is one of the world's most active volcanoes leading to a strange pristine wilderness. The locals largely rely on agriculture for income but tourism has become increasingly popular due to the relatively straightforward trek to the summit of the central crater. 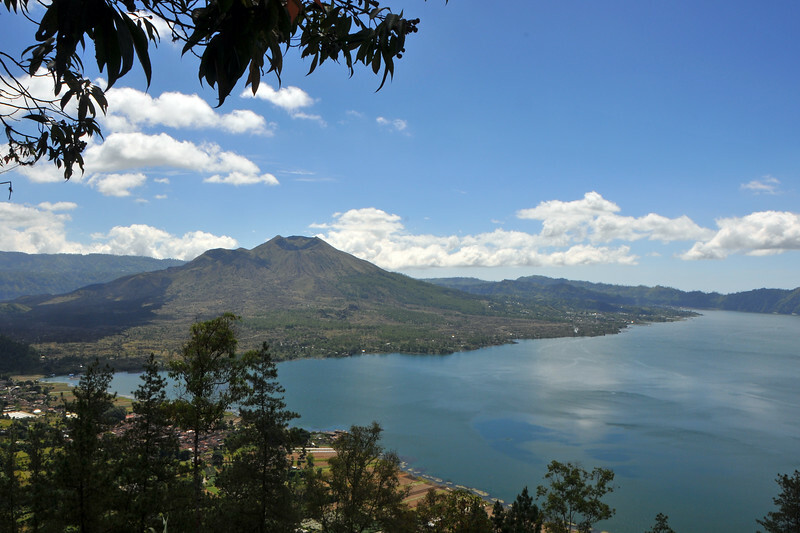 The lake, Danau Batur, is the largest crater lake on the island of Bali and is a good source of fish. 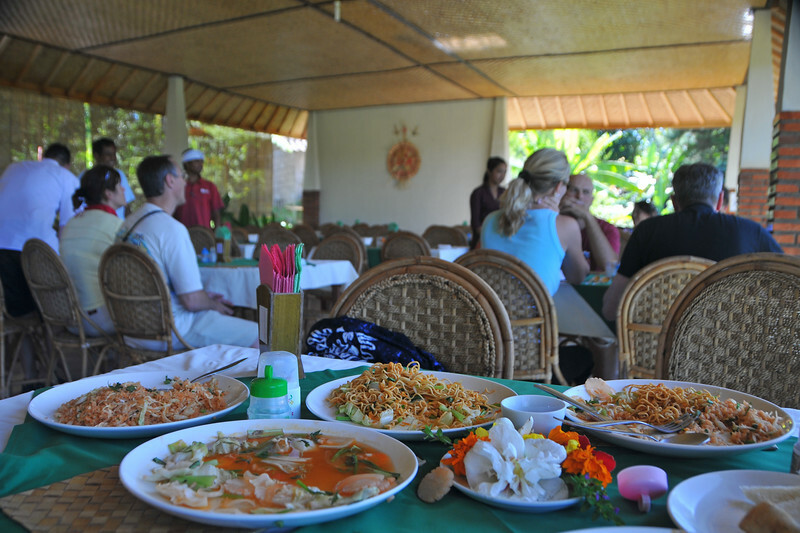 Had lunch at a restuarant which overlooks the lush green rice terrace in Bali, Indonesia. 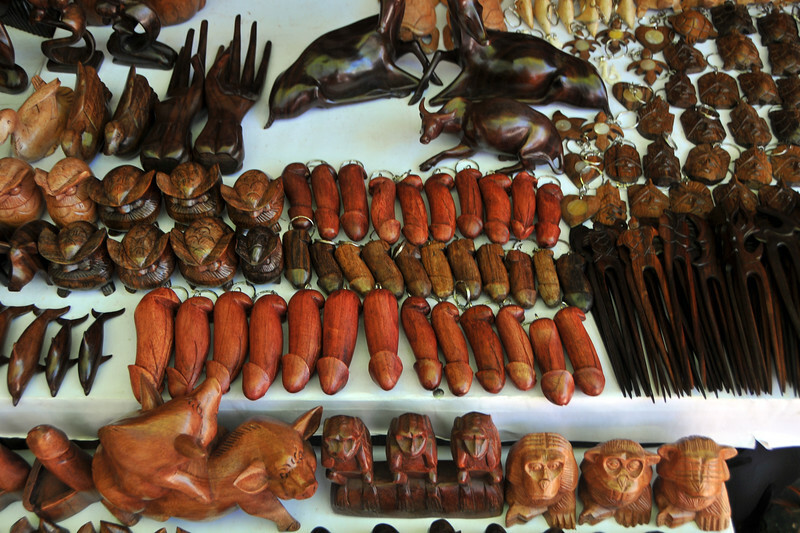 In the shops at Tirta Empul - The Holy Springs and other places it was funny to see various wood-items including phallic bottle openers & keychains. 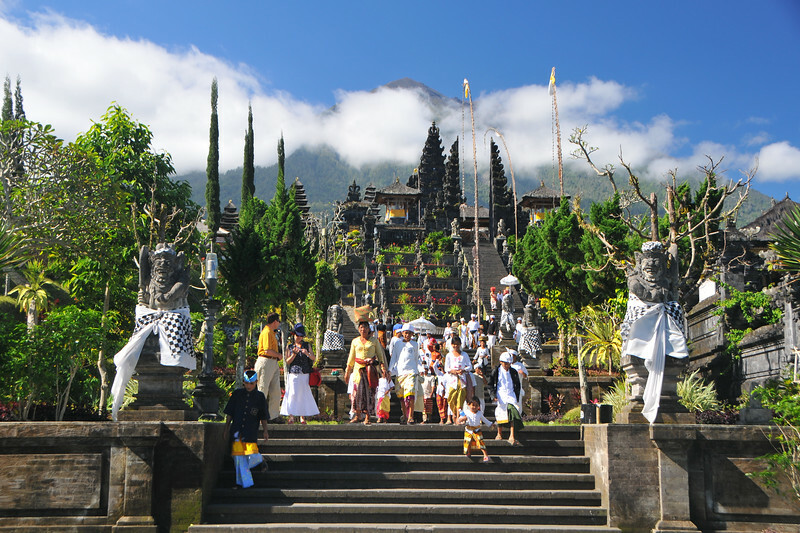 As we reached The Mother Temple of Besakih, we saw a group of Balinese returning from the temple. When someone dies in the family after sometime the whole family goes to the temple and prays for the departed soul. 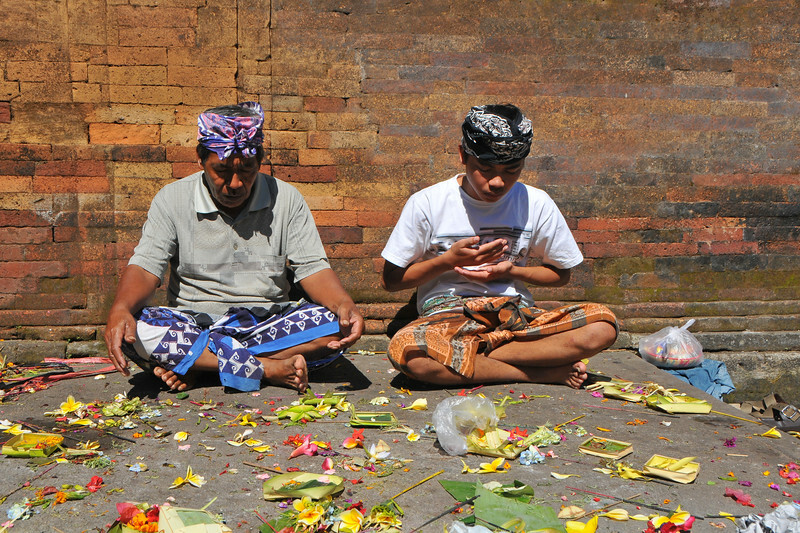 Young boys at the The Mother Temple of Besakih. Mother and son at The Mother Temple of Besakih after the worship. Low lying clouds drift past the mountain and behind the temple. Ceremony taking place at the Hindu temple. 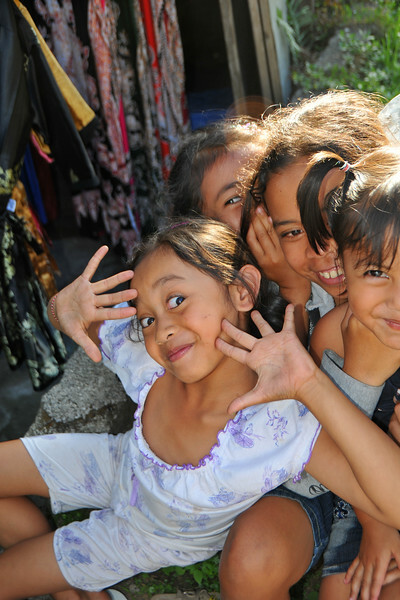 Children playing pranks and striking a pose near The Mother Temple of Besakih - Pura Besakih in the village of Besakih on the slopes of Mount Agung in north-eastern Bali, is the most important temple of Agama Hindu Dharma in Bali, Indonesia and is one of a series of Balinese temples. 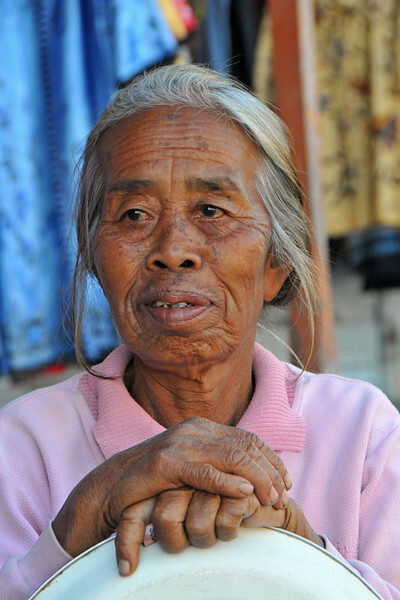 Old lady near The Mother Temple of Besakih - Pura Besakih in the village of Besakih on the slopes of Mount Agung in north-eastern Bali, is the most important temple of Agama Hindu Dharma in Bali, Indonesia and is one of a series of Balinese temples. 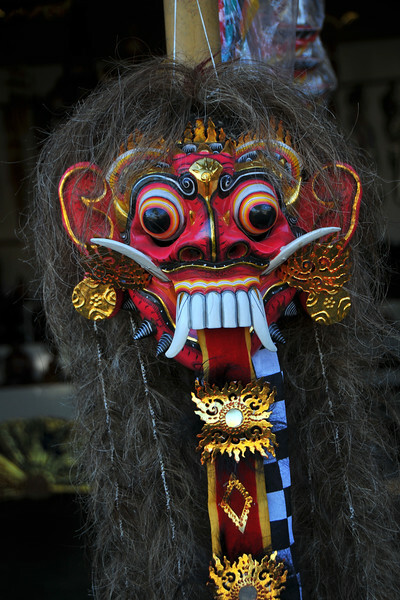 Shops selling various masks and other items on the road leading to The Mother Temple of Besakih - Pura Besakih in the village of Besakih on the slopes of Mount Agung in north-eastern Bali, is the most important temple of Agama Hindu Dharma in Bali, Indonesia and is one of a series of Balinese temples. 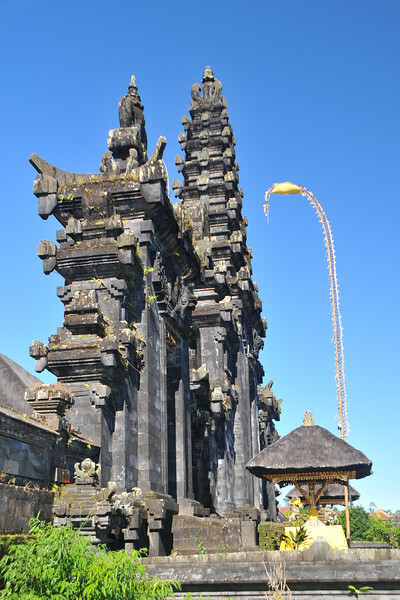 Klungkung Royal Palace, Jalan Diponegoro, Bali, Indonesia was built by the Dewa Agung dynasty in 1710. The existing palace, called the Semara Pura, contains a large square with spacious courtyards, lush gardens, pavilions and moats. The palace that one sees today is actually a reconstruction, as the Dutch destroyed the original palace and grounds during attacks in 1908. 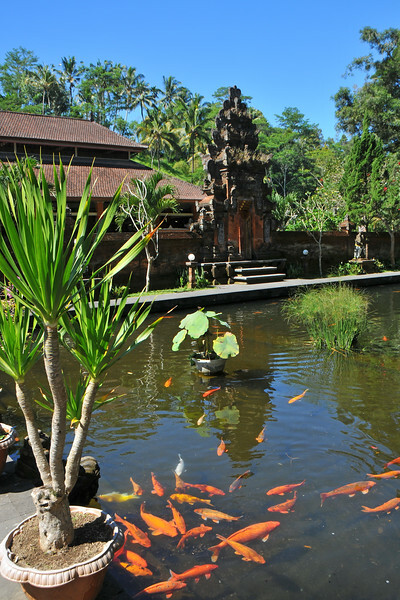 Stone walls with water lilies in the moat surround the very beautiful Taman Gili complex.